Habitat: Desert, Upland, Mountain. It grows in on roadsides, in fields, along desert washes, and in grassy areas. Description: The flower heads are up to 5 inches (13 cm) across and have yellow, pleated rays and a red-brown central disk. The leaves have a rough, scratchy texture and are green, lance-ovate, egg-shaped, or heart-shaped, and up to 1 foot (30 cm) long. The stem leaves are alternate. The leaves and stems are covered in stiff hairs. This wildflower is highly variable and also hybridizes easily. 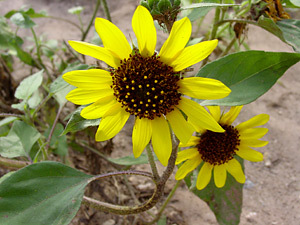 Other similar Helianthus species found here have different leaves (grayish-green in color or shaped differently), are shorter plants, and/or have smaller flowers. Common Sunflowers have many cultivars and are grown as a seed and oil crop, as ornamental garden flowers, and as a wildlife food plant. Birds and squirrels love the seeds. 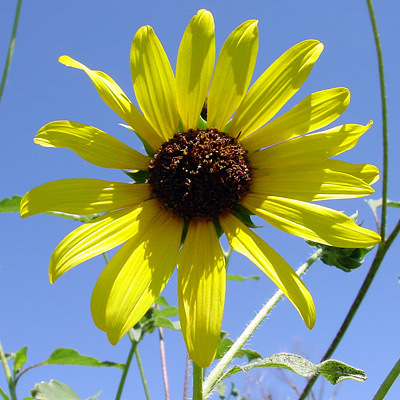 Allergenic – The glandular hairs on the foliage can cause allergic contact dermatitis in sensitive individuals (sunflower allergy). Butterfly Plant – The flowers attract butterflies, especially Whites and Sulphurs (Family Pieridae) in the fall. Culturally Significant Plant – This wild plant was first cultivated and domesticated by Native Americans for use as a seed crop, and with careful selection, they developed varieties with much larger seeds. The seeds were eaten and also used to make sunflower oil. Edible – The seeds are the typical edible sunflower seeds, but they are very small in wild plants, unlike with the cultivated varieties used for commercial seed production. Poisonous – These otherwise edible plants can accumulate nitrate from the soil, which can sicken cattle that eat the foliage. The mature seeds are not affected and are safe to eat.